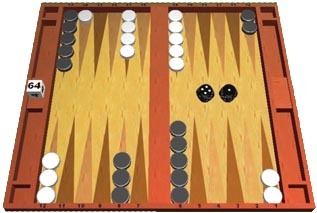 Backgammon is an easy game to learn, but a hard game to play well. Even the best players are often unsure of the right play, and even the best computer programs get confused. Over the years, I have learned several excellent guidelines to checker play that generally guide me to the best moves. I teach all of these to my students, and I know they will be helpful to you as well. Ask three questions. In the early game, ask yourself: Can I hit? Can I make a point? Can I safety checkers? Ask the questions in order. If you can hit in the early game, it is usually right to hit. Then look to see if you can make a point (particularly a key point, like the 5, 4 or 7 point). If you can't do any of the above, see if you can you play safely (don't leave shots). 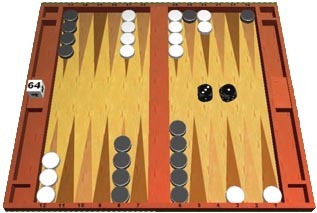 Backgammon is a race. Always be aware of the pip count, and consider the race on every move you make. Generally, when you are up in the race, keep racing! When you are down in the race, look for hitting or holding or blocking plays. In Figure 1 you have a 4-4 to play. You are up 4 pips before the roll, and 20 after the roll. Clearly you have a racing advantage so you should simply run. Move both checkers off your opponent's 7 point (your 18 point). In Figure 2, however, you are well behind in the race, and with the same roll it would be a blunder to move off of the 7 point. You will probably not win this game racing, so your best chance is to hit a shot ... so stay back and make it difficult for your opponent to race. The five-point. If you have a chance to make your 5 point, it's usually right. We are often faced with the choice of making the 5 point or the 7 point, for example, and in most cases the 5 point is the better choice-even if your opponent only has one checker back. 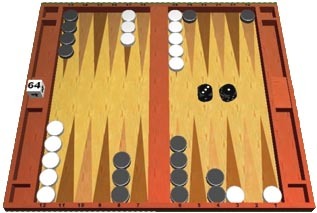 In Figure 3 below, black has a 6-3 and can make either the 7 or 5 point. As the Snowie evaluation shows, it would be a blunder to make the 7 point. Make your points in order. 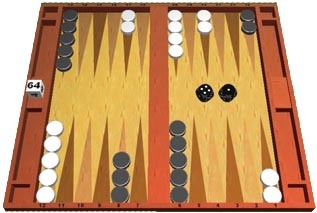 One of the major goals of backgammon is to make a prime ... preferably a 6-prime (6 points in a row), but if not, a 5 or 4 prime. The best way to accomplish this in most situations is by making points next to each other. Figure 4, below, illustrates this concept dramatically. Black has a 3-1 to play. You can make your 5 point or your 3 point. 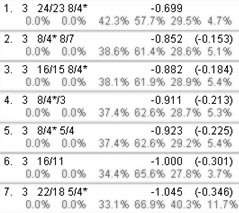 If you make your 5 point, according to the Snowie numbers in the evaluation, you are favored to win the game about 66% of the time, and you would win gammons 23% of the time. If you made your 3 point, however, you would only be favored to win 57% and get gammons 19%. Learn the importance of the 8-point. In the early game, the 8-point is more important than you think, and the strength of the 8 point is key. This is a concept that Kit Woolsey advocated strongly in books, articles, and in personal lessons to me. Nack Ballard and Paul Weaver's new book (Backgammon Genesis Vol. 1) using the latest in computer technology to back up their thinking, strongly reinforces Kit's concepts about the 8 point. In short, the 8-point is important to hold and reinforce in the early game. In the early game, one of the toughest decisions we often have to make is when to split our back checkers (the two checkers that start out on our opponent's 1-point). One of the key determinates to help us make this decision is the strength of the opponent's 8 point. If he has 2 checkers on the 8 point, splitting is an excellent play as it freezes the checkers on the 8 point. By freezing, I mean that he cannot use one of those checkers to make any key, unmade points, without leaving a direct shot. Take a look at Figure 5, below, for example. Your opponent, white, got an opening roll of 4-2 and made his 4 point. You are black and have to play 4-1. 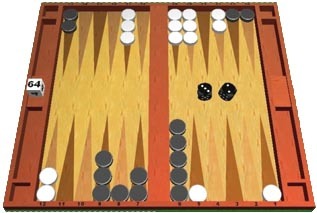 By splitting your back checkers, if he rolls a 6-1 or 3-1 on his next roll he cannot make 7 or 5 point without leaving a direct shot at the blot remaining on his 8 point. If you did not split, he could make one of these key points with little risk. Your split might actually stop him from making a key point or could make him pay dearly if he does. Now look at Figure 6. White opened with 5-2 and brought 2 checkers down, and now you roll a 4-1. Here, according to Snowie (and Kit and Nack and Paul), splitting would be a mistake. You are not freezing his checkers on the 8 point, and in fact, because he has the extra checkers on the 8 point, they can be used as ammunition to attack you and blitz you if you leave shots in your inner board and give up your anchor. The best play is actually to slot your 5 point and play aggressively on the other side of the board. Slotting your own 5 point offers the additional benefit of unstacking your 6 point. Don't stack your checkers. Stacks are great at the pancake house, but not in backgammon. Avoid putting too many checkers on the same point as that greatly reduces your use of those checkers to advance your position. Hitting two is fun! When hitting, look to see if you can hit two checkers at once. Often, this is a very strong play, even if you have to leave a direct blot in your inner board. Even though a direct shot gets hit 11/36 of the time, many times that is not a lot more shots than if you only hit one. If you don't get hit back, the rewards can often be great. Take a look at Figure 7. You are black, and have a 4-1 to play. By hitting the blot on your 11 point and the blot on your 5 point, you have made a very strong play that puts you in a terrific position if your opponent does not roll a 5 on his next roll. As the Snowie evaluation shows, not hitting two checkers would be a 26% error. Offense/offense, defense/defense. The basic idea is this: if you are in a strong, offensive position, tend to make the more offensive move when you have a choice. Conversely, if you are in a relatively defensive position, tend to make the more defensive move. For example, take a look at Figure 8, and decide how black should play 3-1. 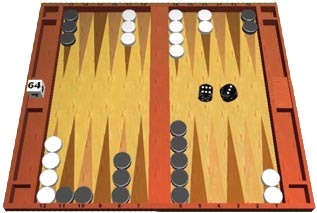 In Figure 8, you are ahead in the race by 13 pips before the roll; you have your 4-point made and your opponent has only one point in his board. Clearly you are in an offensive position and you should make the offensive play of making your 5 point. If you were in a defensive position, you should make your opponent's 5 point, as this would be clearly defensive play. 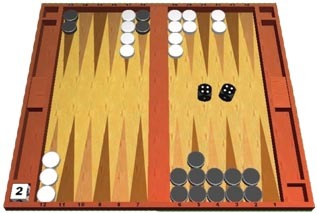 In Figure 9, the correct play would be to make your opponent's 5 point in order to prevent being blitzed (hit in your opponent's inner board and closed out.) 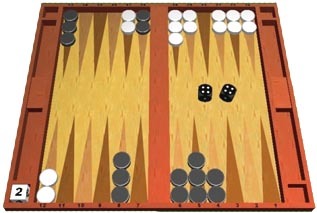 In Figure 9, now it's your opponent that has more inner board points and is ahead in the race. You are in a defensive position, so make the defensive play. Put yourself in your opponent's shoes. If you're not sure which play to make, one exercise that often helps me is to pretend I am the other player and try to figure out which move I would really hate to see the other side make. The play he fears most is usually the play you should make. Putting yourself in your opponent's shoes helps you see the game from both sides of the board, and that will not only help you play your checkers better, it will help you understand his strategy going forward. Bold play versus safe play. When you have more points in your inner board than your opponent, be more inclined to get into a hitting game. When you have fewer points, be less inclined to get into a hitting game. 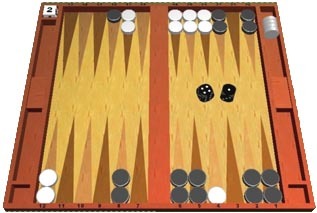 For example, in Figure 10 you have 2 inner board points and your opponent has 1, so with a 3-2 you should hit your opponent off your 5 point and make your 5 point. Any other play would be a huge blunder. 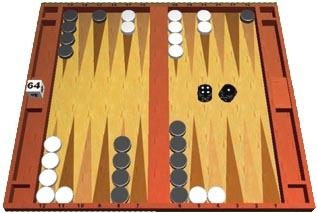 In Figure 11, however, your opponent has 3 inner board points and you have 1, so instead of hitting, it is right to make an anchor in your opponent's board by making his 4-point. Notice that this concept works well with the concept of offense/offense, defense/defense. Use duplication to reduce risks. If you have to leave a blot (loose checker), think about duplication. Try to leave the shot on a number that duplicates something key your opponent can do with that same number. 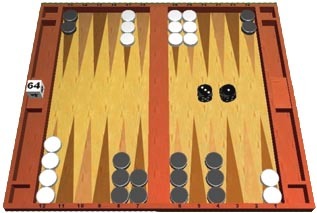 For example, if your opponent has a checker on the bar and can only come in with a 1 or a 4, and you have to leave a blot elsewhere around the board, try to leave your blot where it can only be hit with a 1 or a 4 and you greatly reduce the chances of getting hit. 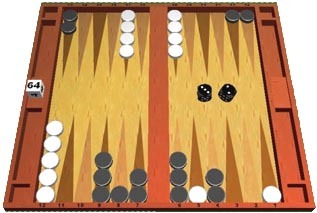 In Figure 12 below, you are black and you have a 4-1 to play. In this position, it is clearly right to hit with the 4 as you are down in the race and you have more inner board points, so you must hit. The question then remains, where should you play your 1? The right answer is 24/23. By leaving your checkers on the 8 point and the 16 point, you have duplicated 4's all over the board. In order to hit two checkers (without leaving a direct shot for you) your opponent would have to roll 4-4, and that happens 1/36 of the time. If you were to move the checker on your 8 point or the one on the 16 point, he could hit two checkers with 4-4, 4-3, or 3-4, and that's 3/36, or three times as often. Getting hit once is painful, but getting hit twice is nearly fatal in many positions. Indirect shots are better than direct shots. 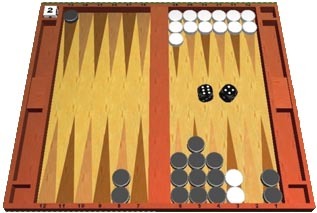 Backgammon is all about odds, and knowing the odds of hitting or getting hit is critical. There are 36 possible rolls of the dice, and if you learn how to count shots, that will often tell you where to leave blots when you have to. Figure 13 illustrates this concept well. You are black and you roll a 6-4. There are only two reasonable choices: move both checkers off your 8 point and leave a 10 for your opponent to hit, or move one checker 13/7 and play off your 5 or 4 point, leaving a direct 4. It's clear that getting hit is fatalyour opponent will double you out immediately after hitting. If you leave your opponent a 10, he can only hit you with three rolls out of 36 (6-4, 4-6, 5-5). If you leave a direct 4, he can hit you 11 rolls out of 36 (4-1, 1-4, 4-2, 2-4, 4-3, 3-4, 4-4, 4-5, 5-4, 4-6, 6-4). 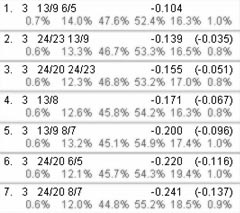 As you can see from the Snowie evaluation, if you leave the 10 shot you win this game 72% of the time, and if you leave the 4 shot, you only win 59% of the time. That's a huge amount of equity to give away on one play. The position in Figure 13 is an extreme example to illustrate the point, but often we have the choice of leaving 7 shots vs. 3 shots. 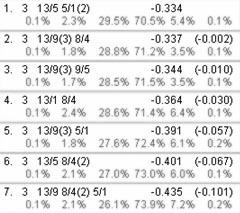 Even there, with a difference of only 4 shots, the equity difference is substantial. Remember, errors accumulate. If you make a few 4 percent errors in one game, before you know it you've given up 12 or 15 percent winning chances. Consider wins, losses, gammons and backgammons. Every time you move, your basic thoughts should be: which move gives me the most wins (fewest losses); which move gives me the most chances for gammons and backgammons; and which move protects me best from getting gammoned or backgammoned. Far too often players make a safe move when it is well worth the risk to make a more daring move that could result in many more gammons. Conversely, it is just as much an error to take a big risk to win a gammon when the gammon chances are low and the play puts the win in serious jeopardy. Don't forget the cube. Every time you move, think about the affect of your move on cube decisions. If one move is likely to entice your opponent to double, and another move is likely to keep him from doubling, the second move is probably better. If one move will probably put you in a position to double on your next roll, and another would not, the first move is probably better. Some moves are clearly right if the cube is in the center, and clearly wrong if your opponent is holding the cube. Always consider where the cube is, and how it is affected, when you move the checkers. Don't forget about the score. In match play, the score affects checker play almost as much as it affects cube decisions. For example, you should play much more aggressively when winning gammons are important to you, and far more defensively if getting gammoned is fatal. At DMP (double match point) you should consider taking risks you would not take at any other score. Look at all the plays before you decide. This is perhaps the most important rule of all! Players often look at two, or even three plays and try to decide which is best, only to find out later that another play they didn't even look at was the best play. Good players start out looking at every possible play, eliminate those they don't like until they end up only with the plays they believe are reasonable, and then make their decision. Less experienced players often don't even look at both sides of the board before making their decision. I have often seen players make a play, pick up their dice, and immediately realize they could have hit, or could have made a point they didn't see. Don't be one of those players. Sometimes, the third or forth play you see is the best one. The obvious play, or first impression, is not always right. Phil Simborg has been taking lessons and playing for 40 years, and for the past 20 has been giving lessons as well. Phil can thank his many excellent teachers for most of the above concepts. His teachers over the years include: Oswald Jacoby, Kit Woolsey, Joe Sylvester, Laila Leonhart, Perry Gartner, Jake Jacobs, Dean Meunch, Mary Franks, Neil Kazaross, Nack Ballard, John O'Hagan, Howard Ring, Danny Kleinman, Mary Hickey, Paul Weaver, Malcolm Davis, Dana Nazarian, Bill Bartholomay, Michael Corbett, and Steve Sax.